A while ago now I made these (see blog post here). I used a pattern that I had in my knitting pattern file (aka My Knitting Bible) for ages so I have no idea where it came from! It's handwritten so I can only assume that I copied it from somewhere at some stage. Quite a few people have asked me for the pattern so I'm going to post it now but PLEASE note that this is NOT my own pattern and that it must belong to somebody, somewhere! I apologise for not being able to give credit where credit is so obviously due but if anyone recognises this pattern and has a link to it, please please please let me know and I will most definitely publish it. Directions are for size Small/Medium; changes for size Large/XLarge, are in parentheses. Knitting Needles: 4.5mm [US 7]. Place markers (2), small stitch holder, yarn needle. GAUGE 19 sts = 4"; 26 Rows = 4" in St st. CHECK YOUR GAUGE. Use any size needle to obtain the gauge. Abbreviations: Inc = increase; k = knit; mm = millimeters; p = purl; psso = pass slipped stitch over and off needle; st(s) = stitch(es); St st = Stockinette st; tbl = work st as instructed through the back loop; tog = together; yo = yarn over; * or ** = repeat whatever follows the * or ** as indicated;  = work directions in brackets the number of times specified. M1 (make one stitch) = Lift running thread before next stitch onto left needle and knit into the back loop. Row 1 (Right Side): K1, * p1, k1; repeat from * across row. Row 2: P1, * k1, p1; repeat from * across row. Cast on 41 (45) sts. Begin with Row 1, work in K1, p1 rib until piece measures 1½", end by working a wrong side row. Row 1: P3 (4), k13, p7 (8), k1, p17 (19). Row 2: K17 (19), p1, k7 (8), p13, k3 (4). Row 3: P3 (4), k4tog, [yo, k1] 5 times, yo, k4tog-tbl, p7 (8), k1, p17 (19). Repeat Rows 1 - 4 until piece measures 8½" from beginning or length required, then work Rows 1 and 2 once more. Row 3: P3 (4), k4tog, [yo, k1] 5 times, yo, k4tog-tbl, p7 (8), place marker, M1, k1, M1, place marker, p17 (19)– 43 (47) sts. Row 4: K17 (19), p3, k7 (8), p13, k3 (4). Keeping continuity of pattern, continue to inc 1 st after first marker and before second marker every right side row 5 (6) times more, working extra sts into pattern–53 (59) sts; 13 (15) sts between markers. Next Row (Wrong Side): Work across row to within 1 st of first marker, slip st to right needle, remove marker and place next 13 (15) sts on holder for thumb, remove second marker, k1, psso, work to end of row–39 (43) sts. Keeping in pattern, work even for 1½", end by working a wrong side row. Work 2 rows in K1, p1 rib . Bind off in pattern. Slip 13 (15) sts from holder to needle. Join yarn to wrong side, and work 2 rows in K1, p1 rib inc 1 st at beginning of each row–15 (17) sts. Cast on and work cuff same as for Right Arm. Row 1: P17 (19), k1, p7 (8), k13, p3 (4). Row 2: K3 (4), p13, k7 (8), p1, k17 (19). Row 3: P17 (19), k1, p7 (8), k4tog, [yo, k1] 5 times, yo, k4tog-tbl, p3 (4). Row 3: P17 (19), place marker, M1, k1, M1, place marker, p7 (8), k4tog, [yo, k1] 5 times, yo, k4tog-tbl, p3 (4)–43 (47) sts. Row 4: K3 (4), p13, k7 (8), p3, k17 (19). Keeping continuity of pattern, continue to inc 1 st after first marker and before second marker every right side row 5 (6) times more–53 (59) sts; 13 (15) sts between markers. Complete same as for Right Arm. Sew thumb and side seams. Weave in yarn ends. I really hope you enjoy making these. 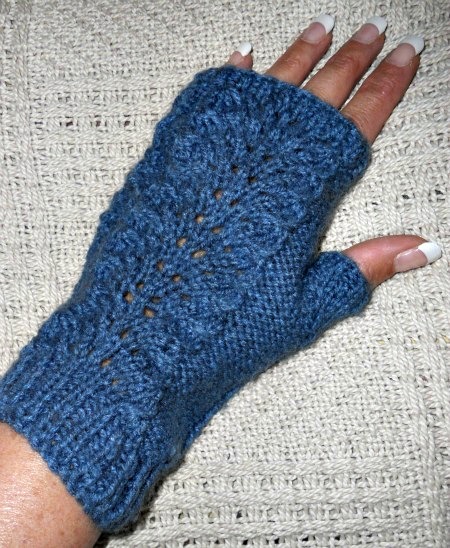 They're quite easy if you have moderate to advanced knitting skills and I've worn my ALOT so they're well worth the effort!! !